Delphi is a sacred site for the western world, Apollo's lyre and its tortoise carapace has been lingering in Parnassus for thousands of years. Here also the ladybird spider lives but is now endangered. Myth, nature and contemporary performance merge and come to light from the darkness. The identity of the tortoise, slow wise, intentional can benefit from the wily precariousness of the spider, with its many eyes and legs, spinning and weaving habitat for a new creature which comes into being through creative collaboration This metamorphoses was created by soundartists, walking artists, dancers, choreographers, a weaver and videographers. 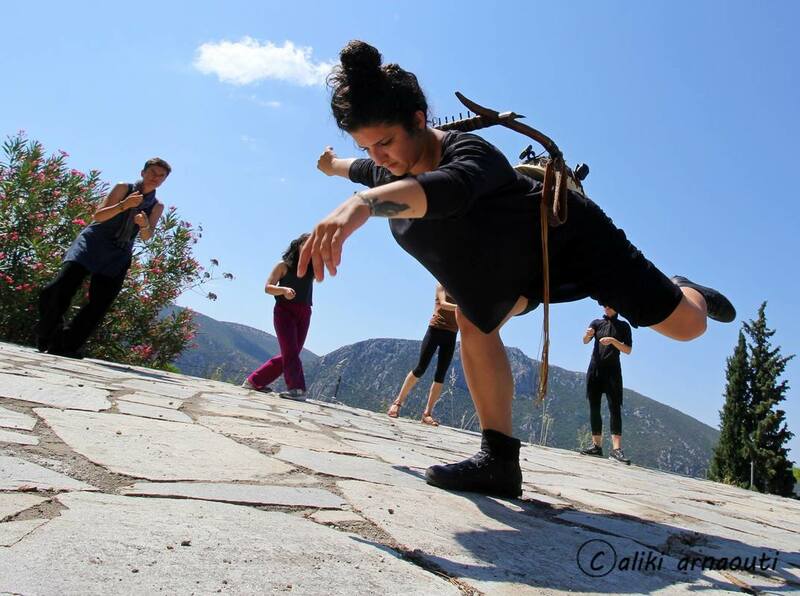 Together a giant walking people harp came into being from the fusion of tortoise and spider, beginning a processional offering from the Sikelianos Amphitheatre above the modern village of Delphi on the sacred Parnassus mountain. ​Thanks to all participants for sharing this continuing journey. The Tortoise and the Spider has begun its walking pilgrimage, making its way from Europe to America and back to Australia, the only continent without Tortoises. The Tortoise and the Spider - a sonic metamorphosis - was the fifth in a series of works conceived by Ros Bandt, invited guest artist for the 2017 Animart Festival directed by Vassilis Boutos. 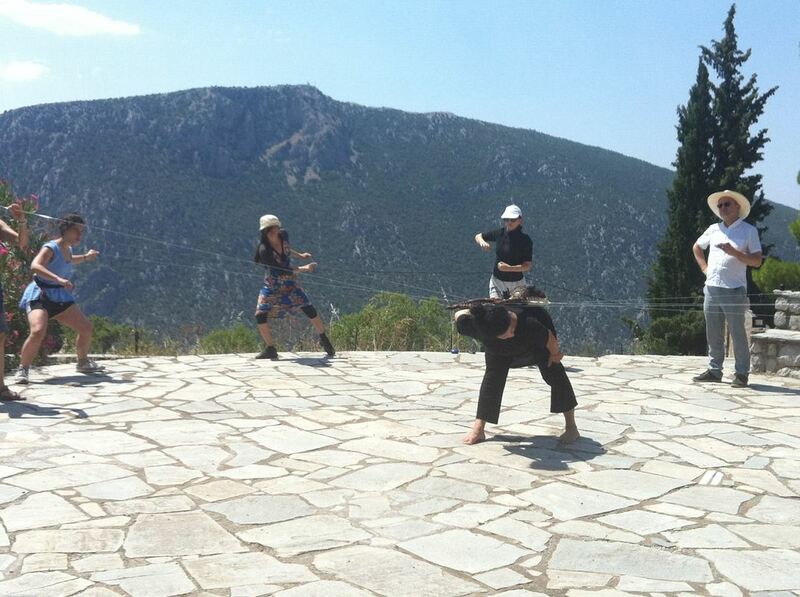 Geert Vermeire, director of the simultaneous Made of Walking event, offered to collaborate on the work, facilitating the participation of 10 walking artists/dancers and a weaver in Delphi and taking the work further and beyond. This site- specific work was designed to be created by all the participants together in situ. ​NEXT YEAR: MARK THE DATE. or online at www.hearingplaces.com The tortoise and the spider may arrive.